I have added notes to these two aerial photos kindly sent as a courtesy and taken by Rebecca Hill while her husband Dann piloted a rented plane yesterday. Click on the photos for a larger view size. 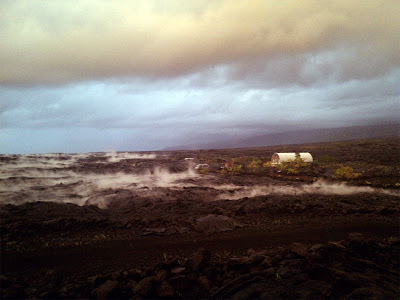 Below we have a photo courtesy of a local Kalapana Gardens resident taken at daybreak this morning after a rain shower. 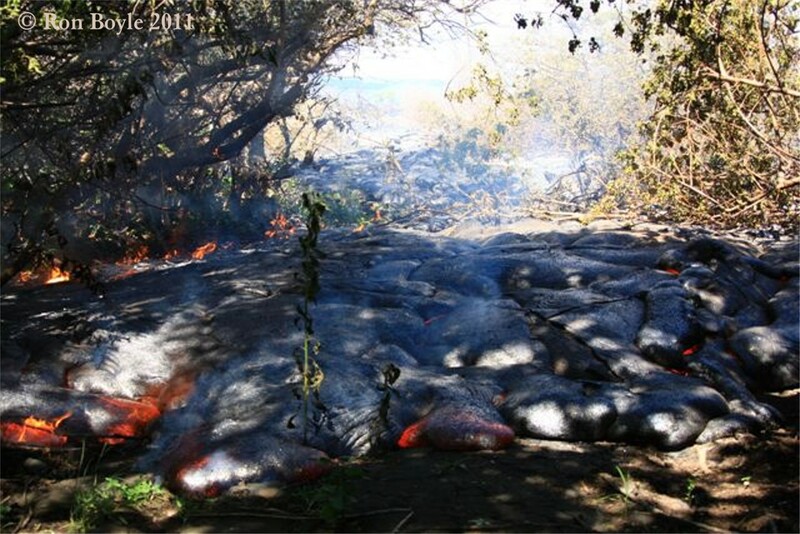 The rains caused the hot lava in the vicinity of the home to steam. 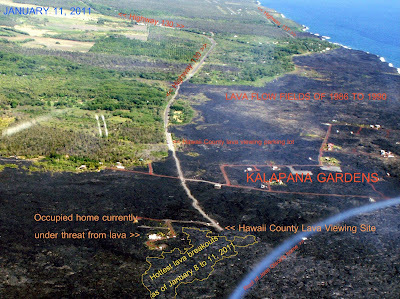 Lava breakouts near the home have slowly stalled close to the house but continue advancing 600 feet to the south of it, as shown in my photos from yesterday. 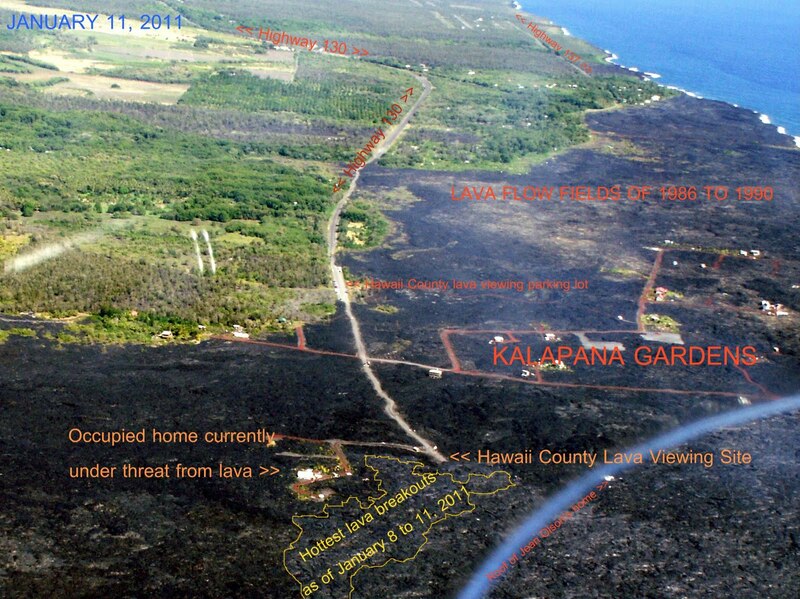 This change in direction has offered relief from what appeared to be imminent danger just a few days ago – such is the nature of Pele. 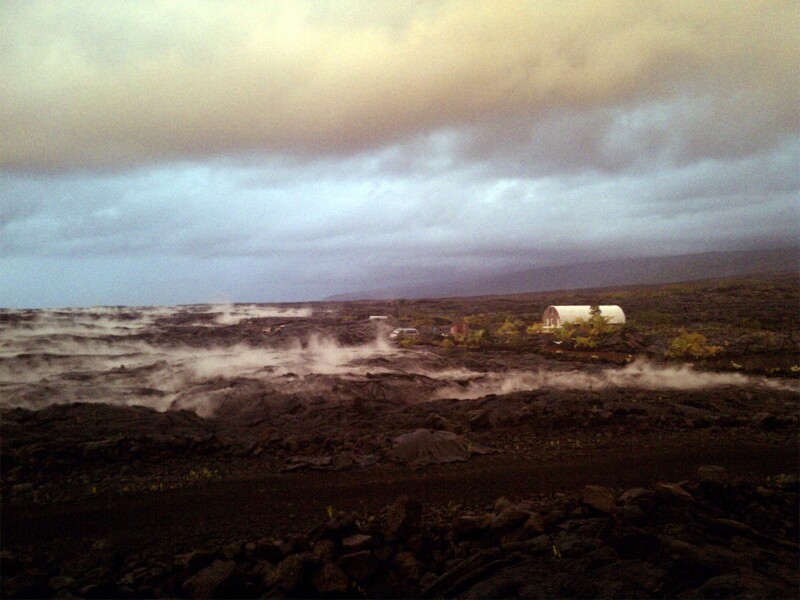 To see some of the lava breakouts near this house in action you can watch my Big Island Video News report for today. 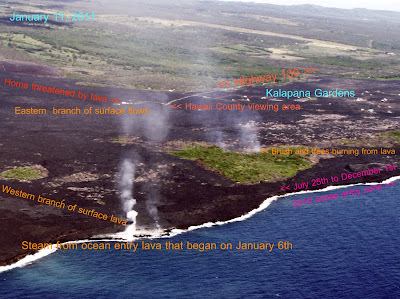 Meanwhile an ocean entry continues further down the coast; being fed by one of two western lobes or branches of lava from the base of the Pulama Pali. Another branch of lava has been slowly etching its way through a remnant portion of forest near the coast. Yesterday Ron Boyle captured this photo of that. 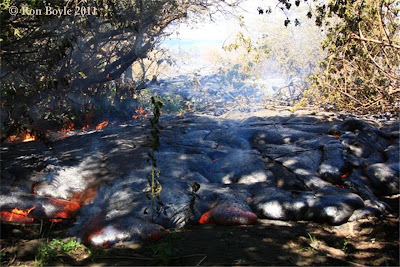 Hawaii County lava viewing area was closed the last two days due to southerly winds blowing degassing lava fumes and ocean entry laze fumes back overtop the viewing site at roads end. To find out of the area will be open phone 961-8093 for Civil Defense hotline updates or phone the Janguard on site security management after 2:00 PM at 430-1966 or 217-2215. Management will be on site until 10:00 PM. The National Weather Service out of Honolulu have many weather warnings posted this morning as yet another winter cold-front storm is sweeping down the Hawaiian island chain and causing some serious flooding in some areas. Currently Maui is being flooded. This enhanced radar loop shows some of this front. The forecast for the Big Island also includes a heavy snowfall warning for the tops of Mauna Loa and Mauna Kea with accumulations of 10 to 18-inches on top of the snow that fell up there Monday night. Wow, what a cool website and very nice pictures. I'll be following it between now and my next trip to the area! Thanks for keeping us updated. I don't know when I'll be in Hawaii next, but it's fascinating to keep abreast of Pele's handiwork in the meantime. Your photos and label graphics are so much easier to figure out than the USG site! Thanks!